To increase brand awareness and create merchandise that perfectly fitted the brand. Tee Shirts seemed a bit predictable & unimaginative for such an exciting company! 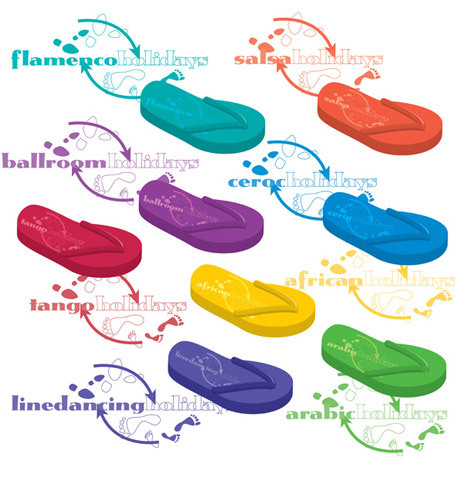 At this time, believe it or not, flip flops weren't widely available so we came up with the idea to brand flip flops in the colours that matched their 'dance style' identities. Sold not only to generate extra profit but to engage and involve clients and their feet! We were also aware dancers need shoe bags to protect their dance shoes, so we recommended branded bags in all the colours they perfectly affirmed the brands. Other items we recommended; branded shoe horns, beach towels, along with the usual caps & tee shirts. They have yet to produce any branded merchandise despite the increased revenue and brand presence it would have given them, plus the chance to expand the range into items such as jewellery, toiletries, and other dance wear etc..